Under settings on the left hand side of the admin landing page, the admin can fix how the system performs in accordance with the organisational policies and practices. All of the settings are reversible and can be changed any time. Adjust the first drop down menu in settings to control which items staff can see and claim. We advise that staff should be able to claim items from other organisations. You may want to remind staff who are adding items about a policy or control measure. 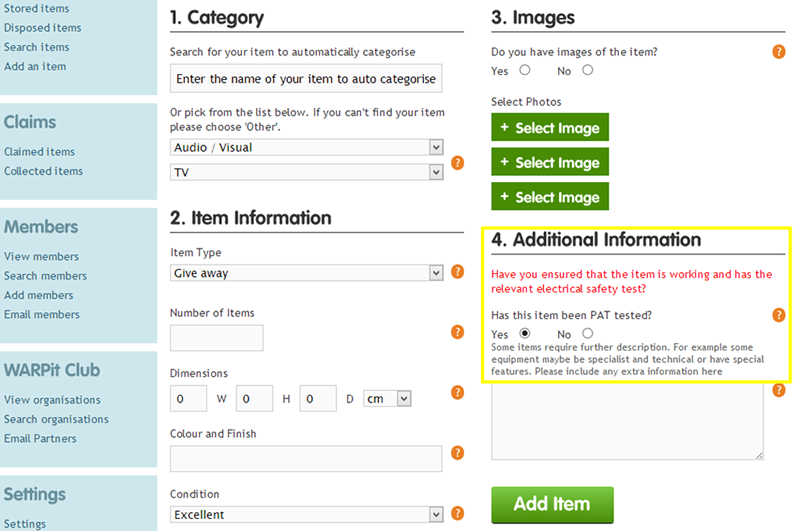 When staff are adding an item, the admin can apply a check box and a customised requirement/message. The user will not be able to upload an item without checking the box first. *Warning* the number of obstacles you put in the way of staff is inversely proportional to the participation rates. We only recommend enabling this option if it is really necessary. The admin sets how and when items are available to staff and 3rd parties under “settings” on the left hand side of the admin landing page. Internal staff are always prioritised. 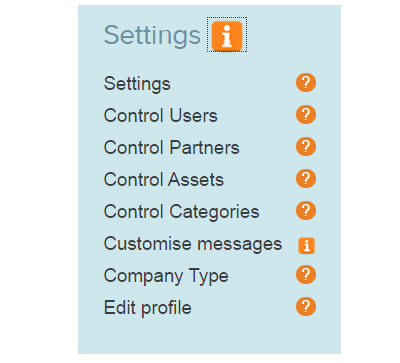 Under settings the admin can control at which point 3rd parties get access to the internal items. The resources are advertised to Priority 1 first to maximise the savings that can be made. When items are not claimed by Priority 1 they can become available further afield to reduce disposal costs. The individual uploading the resource adds a deadline. Depending on the settings, as the deadline approaches the items become available to external bodies – if settings allow. At the moment this phantom deadline is 1-30 days before the actual deadline. That is , 3rd parties can access assets from the primary organisation 1-30 days before the end of the deadline depending on the settings. Priority 2 organisations are those that have “friended” or linked with the priority 1 organisation. Items from priority 1 organisation become available to priority 2 orgs up to 30 days before the deadline which has been set by the uploader of the resource. Any other organisation on Warp it is called Priority 3 organisations. If the option is enabled items become available 1,2,3,4 or 5 days before the deadline ends. In this fashion there is a tiered priority for the availability of assets running from internal staff to preferred partners- to the whole network. Please see “Settings” for how to implement the deadlines. Items can be sent to storage if required. Where storage is available a “storage email” is specified in settings. Once an item is added and is not claimed internally, the email owner receives notification that an item has expired and is unclaimed. If the organisation has storage space Warp it can act as a stock management system. As an item approaches the deadline which has been set by the uploader , instead of being offered to partner organisations, the information about the item is passed to the individual who manages the store. With this information the storage manager carries out the physical process of moving the items into the store. The admin or storage manager should then log into the account and relist the item- changing the location to storage- and extending the date to the last point that the item will be stored. The standard users can then search and claim whatever is in the store without having to visit. This setting overrides any external sharing ability. Under “Control Assets” in settings the asset transaction can be controlled. As well as give away- items can be loaned out or sent for recycling/refurbishment. 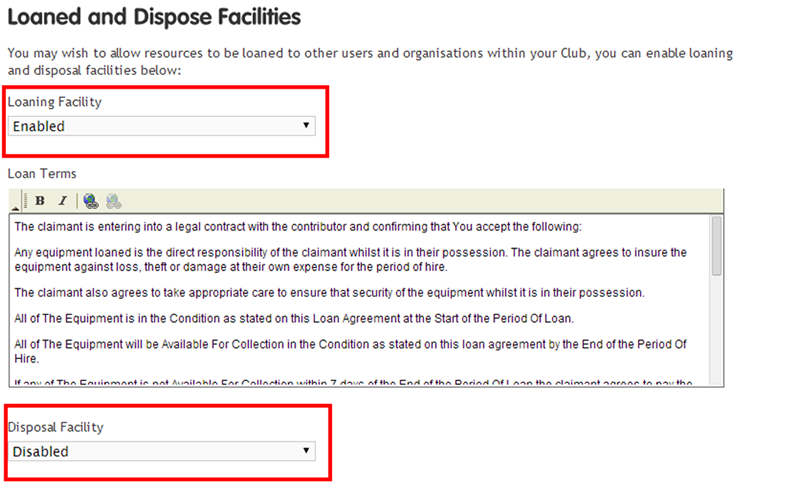 The loaning feature can be used to lend or rent items to others within your organisation. This could be pool items like bikes, cars, tablets. Or items which are common to all departments like a frame boards, digital cameras etc. To enable or disable this feature choose from the drop down menu. 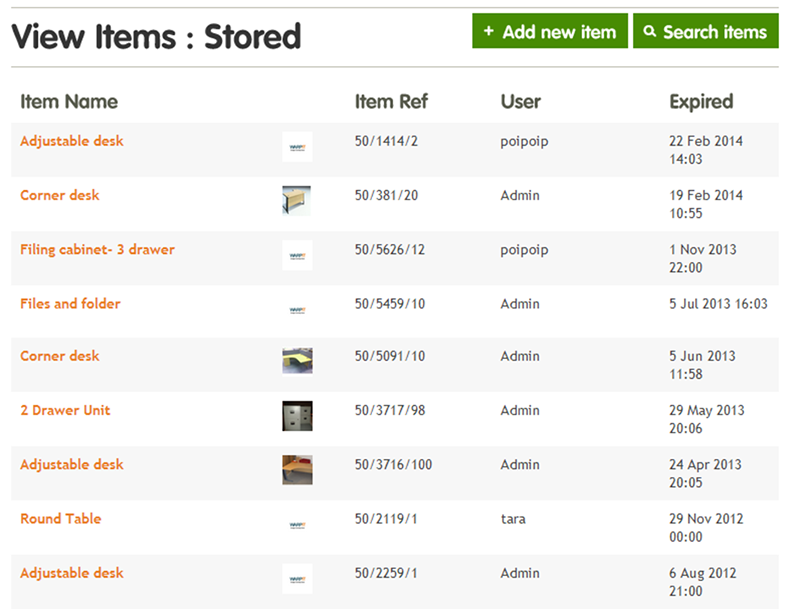 A further feature which should be enabled is the ability to add items for recycling or refurbishment. As an advanced setting it is possible to use the system as a bulky waste collection system. We would advise enabling this once your staff are used to the system. If the organisation is concerned about reusing electrical items, there are a number of control mechanisms. To stop electrical items going live they can be re-routed to a specific email. The item will not go live on the site. Or the setting can be fixed so that electrical items are put up for reuse to “internal only” before passing to the specified email address. We advise on the latter setting to maximise resource use. Electrical items can be restricted to internal only. If they do not get claimed the info can be sent straight to the WEEE contractor or head porter for example. When uploading an electrical item the user is asked if it is PAT tested or not. When claiming the item the new user agrees to get it PAT tested before use. To help your users understand and behave in accordance with policy and procedure, there are a number of messages which the system sends, when users carry out certain activities. For example when a user claims an item- how do they know how to do the physical transfer? The admin can add in instructions in the customise messages section. It is advisable to customise these messages with colleagues from Facilities Management, Health and safety and any other stakeholders.